In Wisconsin v. Yoder, 406 U.S. 205 (1972), the U.S. Supreme Court held that a Wisconsin law mandating that children attend school violated the First Amendment. In the landmark decision, the unanimous Court held that the parents’ Freedom of Religion outweighed the state’s interest in universal education. Jonas Yoder and Wallace Miller, members of the Old Order Amish religion, and Adin Yutzy, a member of the Conservative Amish Mennonite Church, were convicted of violating Wisconsin’s compulsory school attendance law, which required children to attend school until age 16. 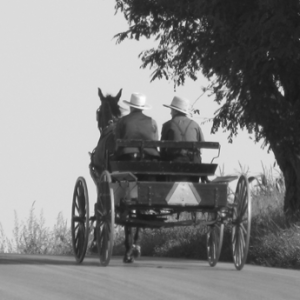 The parents declined to send their children to school after they had graduated from the eighth grade and instead provided informal vocational education to their children, which was designed to prepare them for life in the rural Amish community.The parents challenged their convictions, arguing that they sincerely believed that high school attendance was contrary to the Amish religion and way of life, and that they would endanger their own salvation and that of their children by complying with the law. The Wisconsin Supreme Court sustained respondents’ claim that application of the compulsory school attendance law to them violated their rights under the Free Exercise Clause of the First Amendment, made applicable to the States by the Fourteenth Amendment. The Supreme Court held that in Wisconsin v. Yoder the convictions were unconstitutional. Chief Justice Warren E. Burger wrote on behalf of the unanimous Court. In this case, the Court found that enforcing the Wisconsin’s requirement of compulsory formal education after the eighth grade would “gravely endanger, if not destroy, the free exercise of respondents’ religious beliefs.” In support of its decision, the Court cited the longevity of the Amish religion and its long history as a successful and self-sufficient segment of American society.